At 4E Enterprises we offer an extensive array of knobs, handles and pulls at attractive prices. We have unique decorative hardware styles in many finishes including Traditional, Country, Tuscan, Western, Rustic, Contemporary, Victorian, Shabby Chic® and more. We will not be at The La Bahia Antique Show near Burton on HWY 237 in the Spring of 2019. Click below for show sites and places for the Round Top Antique weekend. 4E Enterprises of Blanco Wimberley and Fredericksburg provides discount cabinet hardware at economical prices. We have cabinet knobs and pulls in a variety of finishes and styles. Our knobs and pulls are quality cabinet hardware. Decorative hardware is our specialty. You can find bathroom hardware, cabinet hardware, and kitchen hardware at our location in Blanco Texas in the Texas Hill Country near Wimberley. We also attend Fredericksburg Trade Days, Wimberley Market Days, and La Bahia Antique Show. We have cool knobs and pulls! We believe that having cool kitchen cabinet hardware ( knobs, pulls) can vastly improve your home. 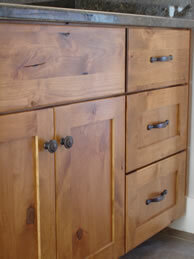 The right hardware can transform ordinary cabinets and furniture into a beautiful home. Our goal is to provide discount cabinet knobs and cabinet pulls. We hope you enjoy our collection of cabinet knobs and drawer pulls for your kitchen and furniture, but mostly we hope that the cabinet hardware you select will bring you complete satisfaction.